Browse this assortment of designer dresses for wedding guests in plus sizes to locate your ideal look for that momentous day. Whether you’re a friend of the bride, cousin of the groom, or just attending to offer your love and support for the happy couple, be sure to do so in style with one of Simply Dresses’ plus-size wedding-guest dresses. You will find fashion-forward trendy plus-size wedding-guest dresses perfect for showing off your inner fashionista. There are contemporary off-the-shoulder and cold-shoulder plus dresses for wedding-guests, as well as classic evening dresses in plus sizes. Nothing says romance like delicate lace, flirty ruffles, and soft velvet. All of the season’s hottest fashion trends are on display for you to choose from in this collection of designer wedding-guest dresses for plus sizes. 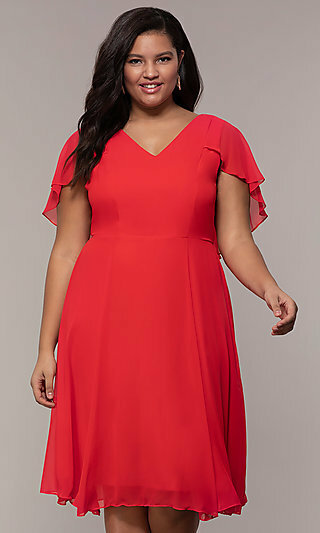 What Kind of Plus-Size Wedding-Guest Dress Should I Wear? The style of your plus-size wedding-guest dress should be determined by the type of ceremony you’ll be attending. For formal celebrations, you’ll want to browse long evening dresses in plus sizes to find an elegant and sophisticated style. If the wedding is more casual, try one of the short plus dresses for wedding-guests or a fun floral-print dress. Wedding ceremonies and receptions are a time to honor the newlywed couple, so be sure your plus-size party dress is appropriate for the formality or theme of the wedding. 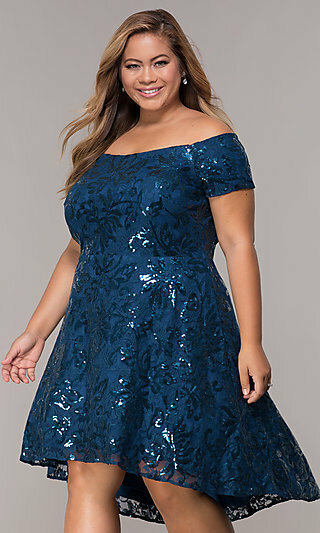 With the variety of plus-size wedding-guest dresses offered at Simply Dresses, you can shop with confidence knowing you’ll find a plus-size dress you adore. 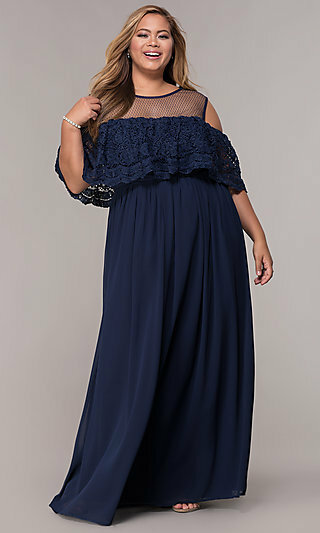 Whether you need a long formal evening dress or a casual party dress in plus size, the immense variety of plus-size wedding-guest dresses in this assortment ensures a flawless figure-flattering look for every woman and any type of ceremony. From classic sophistication to fun and flirty, you’ll find the ideal plus-size wedding-guest dress with ease here at Simply Dresses. 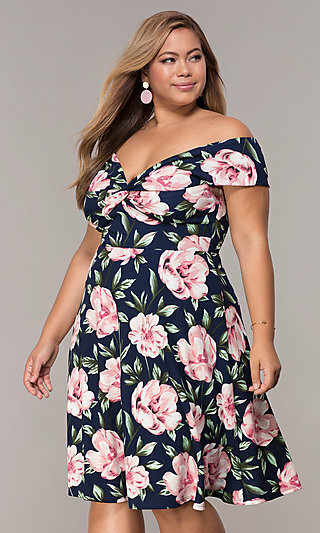 Whatever your personal style, shop Simply Dresses’ plus-size dress assortment, because all you need is love and a gorgeous plus-size wedding-guest dress!